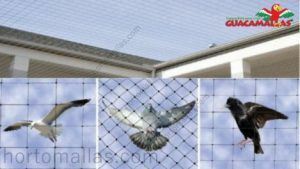 Netting is the only solution for effective avian bird control. Avian bird control: netting is the solution! Bird control barrier netting is the only 100% bird proof solution to keep birds out. Problematic birds stopped by avian bird control net, and rooftop protected with anti- bird net. Avian bird control is a major concern both in urban and in rural areas. In fact, even if birds can be useful to maintain the right balance of insects in the cultivated fields, they can also be very dangerous. Essentially they move in large groups and frequently massively assault crops. For example starlings, black birds, crows, geese and more frugivorous avians, are considered pest birds. 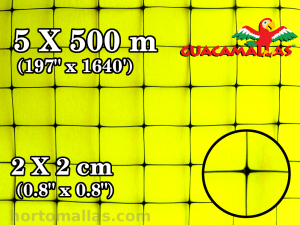 GUACAMALLAS bird nets offer a definite and complete solution for avian bird control. Bird control nets cover the plants, actually impeding the passage of birds of any size. This way it is possible to reduce the application of phytosanitary products with a reduction of labour. Also they allow to grow pesticide-free fruits. 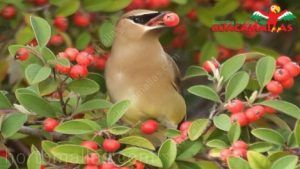 Bird eating a red cranberry thanks to the lack of a protection of a berries plantation. Plastic nets are ultralight, and extremely flexible. They can be easily trimmed to the measurements required. No specialized devices are needed. At Hortomallas we have a technical department that can be a support in designing the best netting project for your specific purpose. 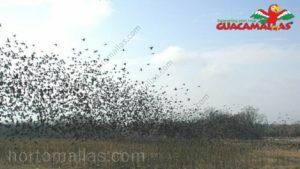 Migrational flock of starlings flying over unprotected field, in just a few hours they can destroy months of investments and work of any grain field. One of the important advantage of GUACAMALLAS nets as avian bird control is that they are economical. As a matter of fact bird netting is easily removable and reusable year after year. It is manufactured by virgin extruded polypropylene. So it is guaranteed for durability. 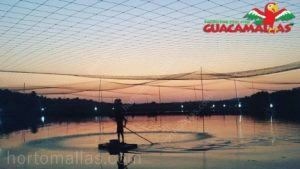 GUACAMALLAS nets last several years even when it is used in open fields because of their UV treatment. Person paddling in an aquaculture tank for shrimp production, protected by an anti-bird netting. 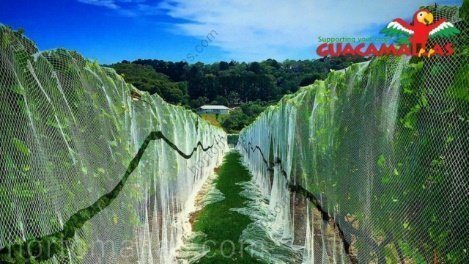 Vineyard protected against damage from birds with colored anti-bird netting. 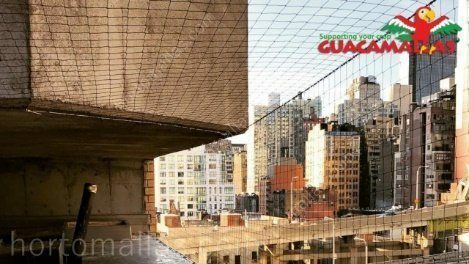 Avian bird control using netting is efficient also against pigeons. Pigeon control is a serious problem in urban and suburban areas. Actually pigeons are attracted by food as they are effective scavengers. In addition they are not afraid of humans. So they use to nest over the buildings, on attics, roofs, and semi open zones. When they access the properties, they roost and will soil and degrade any surface they spend time on. Pigeons especially like to occupy ventilation machinery and drainage systems. 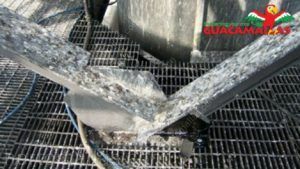 The acid substance contained in the droppings cause permanent cracks on any kind of surface. All in all a huge expense is daily dedicated to clean and repair pigeons damages. To stop pigeons entering any space it is recommended to install GUACAMALLAS avian bird control net. 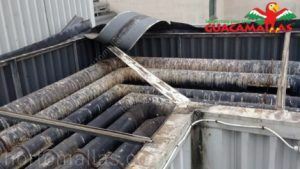 Pipes on a roof without bird netting, damaged by bird droppings. It is not toxic, so it is not harmful for the animals. Bird netting is nearly imperceptible and suitable for any architectural structure. It is simple to apply thanks to cable supports. Pipe corroded by birds droppings. Balcony with anti-bird net protection in city view. In summary, GUACAMALLAS avian control netting constitutes a permanent and strong physical barrier against pest birds. 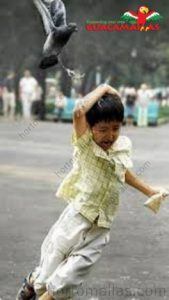 Dove attacking an unprotected child. Pigeons are a real urban pest as their excrement build up can be a health problem as well as a natural vandals of historic monuments.